Like with most advertising programs, pay per click advertising has the potentially to gain you thousands of high quality traffic to your landing page or website. However, pay per click advertising can do this ‘like with most advertising programs‘. What makes PPC different to other advertising formats out there on the internet such as banner advertising or in-text advertising? Here are the main benefits pay per click advertising brings to advertisers. The main different between PPC and most other advertising formats out there is that you pay only for the performance you get. If you have an advert that gains 10 trillion pageviews with 0 clicks, you will pay absolutely nothing. From paying for only the performance you obtain, you can manage your budget a whole lot easier making your whole campaign just that bit more cost-efficient. Although I have briefly mentioned that PPC is a cost-efficient solution to advertising, it will also generally be cheaper and more value for your money. PPC will only bid as high as necessary to gain you the ad position on a website. From traffic being contextual, the conversion rate will be much higher than on other advertising platforms. The cost per click for your adverts usually will work out cheaper than any other advertising platform. The time spent in managing your campaign will be significantly reduced because once you have fully set up the campaign, there is not much more you need to do but a few small tweaks here and there. From every aspect of the campaign, pay per click advertising if making it easier for you to profit while using your time effectively. The best part of PPC is the simple fact that anyone can use it. You do not have to be a multi-national company with profits of millions to use PPC. PPC will adapt to the budgets you set it. For example, I used PPC a few weeks ago to help give one of my eBooks a boost in sales (the Christmas season generally has a higher conversion than the rest of the year). As you may be able to tell, my budget for PPC won’t be massive compared to that of a big business. Even so, PPC is still as effective for me as it is for a company as large as Microsoft or Apple. 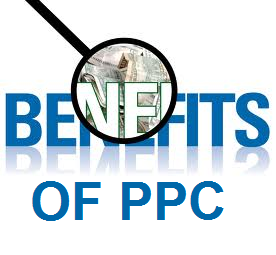 Share your comment 2 responsesTO The Main Benefits Of PPC. Yes, I do agree with you that PPC has gained a lot of importance and it is one of the most demanding advertising programs which can bring results at a much reduced costs. Thanks for the share!! Your much welcome! Without PPC, where would we be! ?